At MAN Marketing we have an in-house full green screen shooting stage, used for filming video. Through cinematic effects and technology, MAN can superimpose subjects onto virtual backgrounds, then place them over digital backdrops. When on-site video taping isn’t an option, or when a desired effect would benefit from the use of a green screen, we have all the necessary assets to create the perfect video. Instead of scouting and shooting on location, we can digitally recreate the background of your scene. 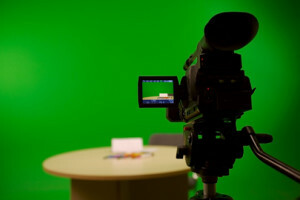 In the visual effects world, a green screen is often used because it is easy for modern cameras to pick up, giving the editor the cleanest possible image. The technique originated in Hollywood in the 1940s because blue & green are the furthest colors in the visual spectrum from red, which is the main color in human skin tones. This makes it easier to separate the background from the subjects in the video.